IDLE HANDS - New Single "A Single Solemn Rose"
Portland heavy metal/goth act IDLE HANDS has unveiled their latest goth-tinged single "A Single Solemn Rose," which is now streaming via Metal Injection. The band's debut album, "Mana", will be released May 10th via Eisenwald. Listen to "A Single Solemn Rose" here. Entering the studio only four months after the release of "Don't Waste Your Time", the heavy upstarts quickly went to work crafting their first full-length record. "Mana" conjures an emotive 40-minute ride into the realms of heavy metal, new wave and goth rock, while continuing to solidify the band's unique brand of heavy music. German Extreme Metallers STELLAR MASTER ELITE have revealed a third song from their upcoming new album "Hologram Temple". "Hologram Temple", the band’s fourth full-length, will be released on 3rd May 2019 via Unholy Conspiracy Deathwork. It was recorded in the band’s own studio while drums, mix and mastering were done together with Markus Stock at Klangschmiede Studio E.
Cruz Del Sur Music is proud to announce the signing of Australian psychedelic rock and roll occultists THE NEPTUNE POWER FEDERATION. The label will release the band’s next full-length, “Memoirs Of A Rat Queen”, this September. 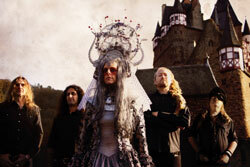 “Memoirs Of A Rat Queen” is currently being mixed, after which, the band will be playing several Australian festivals. Once the album is out, it will be accompanied with a handful of new music videos. "We are very excited about increasing the reach of THE NEPTUNE POWER FEDERATION church internationally - like rock and roll missionaries,” closes Inverted CruciFox. “Perhaps we will become like Scientology only with more guitars, battle jackets and drinking." 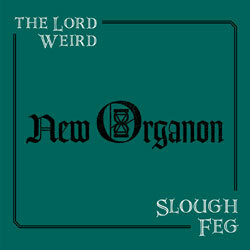 THE LORD WEIRD SLOUGH FEG - New Album Announcement - "New Organon"
Such was the approach for SLOUGH FEG’s long-awaited tenth studio album, “New Organon”, which will see the light of day via Cruz Del Sur Music on June 14th, 2019 in European territories and June 21st in North America. “New Organon” also marks the recording debut of drummer Jeff Griffin (who split studio duties with John Dust) and joins Scalzi and longtime members Angelo Tringali (guitar) and Adrian Maestas (bass). “New Organon” is another definitive statement from one of America’s most enduring and unique true metal bands, whose penchant for THIN LIZZY-inspired guitar harmonies and Scalzi’s timeless storytelling has turned albums such as 2005’s “Atavism”, 2007’s “Hardworlder” and 2010’s “The Animal Spirits” into proto-metal bedrocks. Swedish Death Metallers GODS FORSAKEN have revealed another song of their upcoming new album "Smells Of Death"! The band’s second full-length, featuring a cover artwork by Patrik Tegnander / Chainsaw Design, will be released on 19th April 2019 via Soulseller Records on CD, vinyl and in digital versions. Veteran west coast metallers SKELATOR has signed with Gates Of Hell Records for the release of their fifth studio album, “Cyber Metal”. The album is due June 14th in European territories and June 21st in North America. Formed in 1998, SKELATOR has capably flown the flag of never-say-die true metal, harnessing Jason Conde-Houston’s stratospheric vocal range, dueling guitar harmonies and battle-tested rhythms. 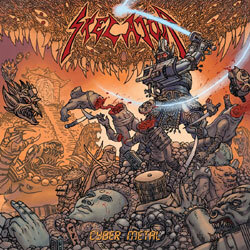 SKELATOR originally met Cruz Del Sur Music/Gates Of Hell owner Enrico Leccese in 2013, who relayed word that SLOUGH FEG leader Mike Scalzi suggested the label sign the band. Fast-forward six years and the two parties have joined forces for “Cyber Metal”. With the goal of making “Cyber Metal” their “most polished effort to date,” SKELATOR has assembled a batch of songs that deftly combine modern German power metal (GRAVE DIGGER, PRIMAL FEAR) as well as classic influences such as JUDAS PRIEST and RIOT. The result is an album with no shortage of screaming vocals, high-flying guitar solos, thunderous bass, gated drums and even extra doses of keyboards. ISTAPP - New Lyric Video "Eternal Winter"
Swedish Melodic Black Metallers ISTAPP have unleashed a new lyric video! The band’s fourth longplayer "The Insidious Star", featuring a cover artwork by Pär Olofsson, will be released on 26th April 2019 via Trollzorn on CD, LP (including a bonustrack) and digitally. Ever since their formation in 2005 in the South East of Sweden, ISTAPP celebrate majestic uplifting Scandinavian art. Impetuous wildness meets highly melodic aesthetics strikingly harmonious! MOLASSES, the new band of The Devil’s Blood singer Farida Lemouchi and her friends Oeds Beydals, Job van de Zande, and Ron van Herpen alongside Marcel van de Vondervoort (Astrosoniq), Bob Hogenelst (Birth of Joy) and Matthijs Stronks (Donnerwetter), will perform at this years Roadburn Festival! Their new single "Mourning Haze"/"Drops Of Sunlight" (12'' & CD) will be released at Roadburn as well, coming via Van Records on 11th April 2019. Iconic, American, technical death metallers, ORIGIN, teamed up with Loudwire to present a new track "Infestation" in the form of a lyric video. The song comes from the band's forthcoming anniversary album "Abiogenesis - A Coming Into Existence", in which founding member Paul Ryan revists the band's earliest & unreleased creations. Outstanding Swedish singer and guitarist JOSEPH THOLL (ex-Enforcer, Black Trip/Vojd, Robert Pehrssons Humbucker) returns with a solo album! "Devils Drum" will be released later this year via High Roller Records!